If last week’s episode was Hitchcock and Scully’s origin story, then this week’s episode is Jake and Gina’s. 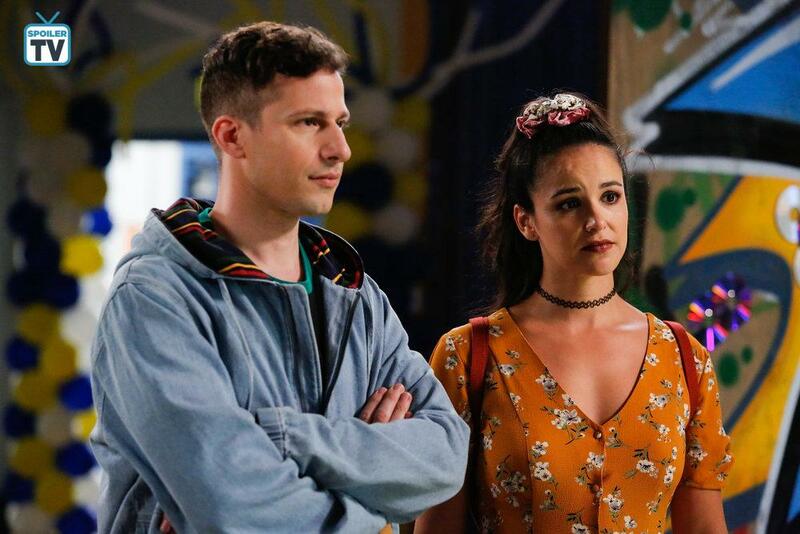 We’ve known since the beginning of the series that Jake and Gina grew up together (their friendship is little-boy-holding-little-girl’s-hand) and that Jake got Gina her job at the Nine-Nine, but in “The Tattler” we see deeper into that relationship than we ever have before, as they attend their twenty year high school reunion. They were the only two members of the DDC (Dope Denim Crew)! They both had long hair and an earring! They were in a ska band together! They were best friends! You see, in Jake’s junior year he was becoming friends with the coolest, hottest kid in school, Brandon Bliss. Brandon asked Jake to skip school with him and his friends, steal a van, and get drunk at his parents’ cabin, but the day they were supposed to leave someone tattled on Brandon, he got suspended, and the whole school believed it was Jake who had told. Jake is obviously still bothered by the fact that everyone remembers him for something he didn’t do twenty years ago, so Amy suggests they find out who the tattler really was and clear Jake’s name. This leads to the two of them breaking into admin and looking up old class schedules to figure out which member of the football team shared third period with Brandon Bliss and could have told him that Jake was the tattler, all while Gina sells an app she just made up (“Todddddler”, Tinder for toddlers) to an old classmate who has become a tech mogul. Jake and Amy successfully track down the only football player who could have started the rumour, and are told that he did see Jake tattling on Brandon to the principal. Or at least, he saw someone with Jake’s long hair, earring, and denim jacket talking to the principal. Realizing that Gina was the one who ruined his senior year, Jake confronts her. Although he’s rightfully angry that his best friend would betray him and then lie about it for two decades, Gina soon makes him see that what she did was for his own good; he was heading down a dark path with Brandon, and if he had gotten in trouble for stealing a van, or worse, he never would have been able to become a cop. Gina was Jake’s origin story (the radioactive spider to his Spiderman) and in return, Jake wants to be hers (the dead parents to her Batman). Gina’s attempt at pitching Todddddler didn’t end well, mostly because their old classmate was also lying about what he’d been doing since graduating, but it did make her realize that building her own business is something she’s always wanted to pursue, she just doesn’t have time between working at the Nine-Nine and raising her baby. So Jake tells her that maybe it’s time for her to move on. He was the one who got her the job at the Nine-Nine, and he’s the one giving the support she needs to leave it. We’ve known for several months now that Chelsea Peretti was leaving the show and that Gina would have to be written off, and I think they chose the perfect way to do it: with a story that focuses on hers and Jake’s origins, as Gina looks towards a new beginning. Back at the Nine-Nine, Rosa approaches Charles about her dating issues; she’s been seeing two people, both of whom she really likes, but they found out about each other and now she has to decide which one she wants to pursue. Charles probably isn’t the best person to approach when you need help making a decision — or maybe he’s the perfect person, as he has an entire binder dedicated to choosing between two things. Rosa remains undecided through all of Charles’ strategies, including answering a 312-question questionnaire and hanging from the ceiling like a bat, only to have the decision made for her when one of the people she’s dating texts her to break it off, because she took too long to respond. Isn’t it cool how Charles and Rosa’s relationship has developed from him having a creepy, unreciprocated crush on her in Season 1 to him being the one she goes to first about dating problems? Although this subplot didn’t have much going on (it would have ended the exact same way whether Rosa had gone to Charles for help or not), I love watching these two together; despite her stoic exterior, Rosa often plays along with Charles’ quirks in a way no one else does, and despite needing to know everything about everyone, Charles respects Rosa’s boundaries. It’s been awhile since Gina was in the main plot of an episode, I’d forgotten how much she can bring to the show — and how well she and Jake play off of each other. Nice of them to remind me right before she leaves. Seeing Amy back in a high school environment was an absolute delight. Was anyone else surprised and then not-so-surprised at Jake’s perfect attendance record and community service? Despite his cavalier attitude towards some things, there’s a reason Jake’s a really good cop. 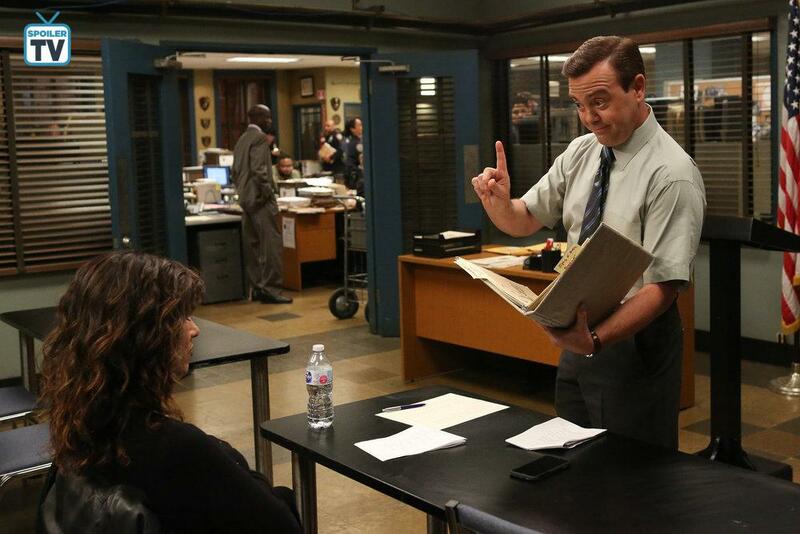 Brooklyn Nine-Nine airs Thursdays at 9/8c on NBC. Sam Makowski is a published author, avid writer, and world traveler from Calgary, Canada. Not only does she enjoy writing, she also enjoys analyzing the writing of others, whether it be movies, books, or TV shows. In particular, she loves deconstructing themes, characters, and story arcs as well as speculating about what's to come.